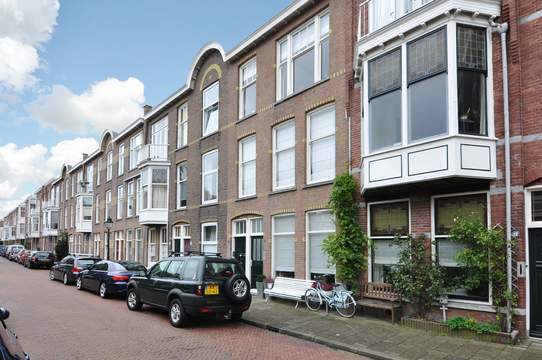 Thorbeckelaan 719 Price asked € 190.000 k.k. Very conveniently located opposite the De Savornin Lohmanplein and public transport, bright 4-room apartment on the 3rd floor with lift. Storage in the basement accessible from a sunny communal garden and closed porch. Closed porch with electric door, videophone system and lift to the 3rd floor. Entrance apartment, spacious hall approx. 4.85 x 1.88 with herringbone parquet floor, wardrobe, built in cupboards and videophone system, spacious toilet with hand basin. White tiled bathroom approx. 1.77 x 1.56 with bath and washbasin, bright back bedroom approx. 3.97 x 2.77 with laminate floor and deep built in cupboard approx. 1.10 x 0.80. Kitchen approx. 2.90 x 1.88 with white kitchen unit, various loose appliances, connection washing machine/dryer and access to the balcony approx. 2.58 x 1.07 with balcony cupboard. Room en suite approx. 10.46 x 3.86 partly 3.29 with sliding doors and 4 built in cupboards, fire place with drain, light laminate floor, open views and access to the balcony. Spacious front bedroom approx. 3.45 x 2.86 with laminate floor and built in cupboard. Storage in the basement approx. 3.81 x 1.50 to be reached from the communal garden and porch. Closed communal sunny garden accessible to the residents. Eternal lease-hold land. The rent charge is € 392,15 per year, based on a land value of € 17.050,- (= redemption) and a rent rate of 2,3%. Review rent rates by 1 January 2021. 222/10.000th share in the community. Active Owners Association, contribution € 171,81 each month. Electricity 3 groups and one group with circuit breaker. The volume of the apartment approx. 270 m³. Shops at the Savornin Lohmanplein and Vlierboom- and Appelstraat. Public transport (RandstadRail line 3, bus 21 and 23), exit roads through Westland Road and route Sportlaan/International zone. “De Waterthor”), tennis, football, hockey, handball and horseback riding.